Chair-washing M00924, buy at the price of 579 in Europe. Excellent choice, made in light tone, light metal and solid ceramics. 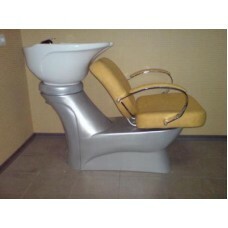 It is ideal for private hairdresser practice or beauty salon of high level. Upholstery is durable and water-resistant, so even long operation will not affect the appearance of this beautiful chair-washing. This model of furniture meets the latest fashion trends of cosmetic furniture - establishing it in your office, you will add "flavor" in the interior and emphasize the modernity of your salon. If you are interested in not only reasonable prices, but also the quality products for beauty salons, the company "European Medical Systems" can meet all your wishes.